Human rights activist Svetlana Gannushkina. Photo: Kirill Kallinnikov / RIA Novosti. All rights reserved. 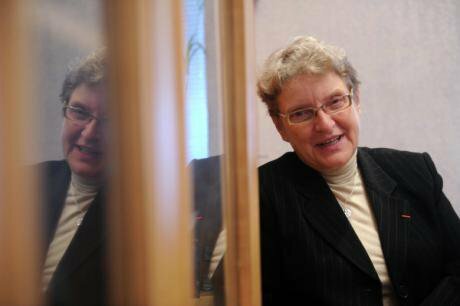 Russian human rights campaigner Svetlana Gannushkina has spent several decades defending the rights of refugees and forcibly displaced persons. She is the Chair of Russia’s Civic Assistance Committee, heads Memorial’s Migration Rights Network, and until 2012 was a member of Russia’s Presidential Council on the development of civil society and human rights. During a recent trip to Grozny, I spoke to her about Russia’s “merciless revolt”, her own anarchic nature, Chechnya and why the Russian Constitution resembles mathematics. You have a copy of the Russian Constitution on your desk. Yes, I carry it around with me everywhere. This is my third copy – the first two fell apart from wear. I’m still reading it. I’m convinced that you always need legal texts before you. But the Constitution is difficult to change. It’s easy, however, to change your reading. I’m a mathematician by profession, and in maths, if you’ve learned a theorem and know its proofs no one can shake your knowledge. But laws are subject to different interpretations. Article 81 of the Russian Constitution states clearly that no single person can occupy the post of President of the Russian Federation for more than two consecutive terms. But linguists have been found, who interpreted to suit the authorities’ needs. Does the problem lie in an insufficiently stringent law? Do you mean that the relevant article was not formulated clearly enough? Yes, it seems there can be different readings. The Constitution encompasses the essential concepts of how a legal system should work. In mathematics, these basic concepts are known as axioms. I remember: an axiom is a truth that doesn’t requires proof. What does that mean: “doesn’t require proof”? That means that it is impossible to prove, since we ourselves build a theory on the basis of the specific qualities that describe our object – in this case, our system of government. A system of legal axioms – that’s what the Constitution is. And what do we require of an axiom? That it contain no internal contradictions. As for truth, that’s irrelevant here. We can require our axiomatics to contain the abolition of the death penalty, gender equality and minority rights – and that will give us one legal system. Or we could require other principles and have another one. So what does that make truth? What would a law contradicting the Constitution be in mathematics? A theorem, an assertion which is incorrect. “You are our pride”, “You are our figurehead”, “A person of honour and conscience”, “Thank you for your selfless life” – these are a few of the comments on your social media pages. Many people value you. People write different things. The best poster about me that I ever saw read: “Gannushkina is the mother of anarchy”. If anarchy is the mother of order, I must be its grandmother. My father always said that I had an anarchic nature. He was right! Where did that poster come from? It was from a rally outside the High Court in Grozny: a protest action against us, in fact, as we are now involved in a court case with the Chechen Interior Ministry, which is suing us over defence of its business reputation. Admittedly, afterwards one of the protesters who were portraying an angry crowd came up to me and said: “Our apologies: they made us do it”. People do remember Anna Politkovskaya, Natalya Estimirova and Viktor Popkov. But they are afraid to talk about things openly, because Ramzan Kadyrov and his associates have sown fear and obsequiousness all around. But there is also a new generation, some of whom see Kadyrov as a model of masculine strength, power and money, while women are becoming second-class creatures. You wrote in 2008 that during the Chechen War it was women who “saved their sons, husbands and brothers” and who “helped our people survive”. But you also write that women are repressed in today’s Chechnya. It seems there’s a paradox here. It’s not a paradox. And unfortunately it’s not a purely Chechen situation. In wartime, women raise their social status, change their role in society, they shoulder all the responsibility for their entire family. It was Chechen women who blocked roads, held up tanks, demanded the return of their husbands. When there was a real campaign against Chechens in other Russian regions, when men were afraid to leave their homes, their wives drove around the markets, sold things, cleaned rooms and earned the money to feed their families. And then...then men take revenge on their wives because they were unable to protect them. This thought occurred to me when I read about how the most civilised French men behaved towards women accused of collaborating with the Germans after France’s liberation in 1944. They beat them and shaved their heads, to punish them for their own humiliation. It’s 2018 now. Are you still working on Chechnya and Nagorno Karabakh? Not a single wave of refugees has been completely integrated in Russia, and not a single conflict is over. The housing problems of refugees from Azerbaijan who fled to Russia in the early 1990s have still not been resolved. Have there been changes in Chechnya? Well, here we are, in the centre of Grozny. You can see how the streets are lit up, how many pleasant cafes there are, how people are relaxed as they stroll along. We know it’s not completely safe, even here, but there’s no comparison with what it was like during the war. Back In 2002, Lida Yusupova [the former Grozny head of the historical and civil rights organisation Memorial] and I were wandering around these streets, still chaotic after the Second Chechen War, and she suddenly said calmly, as though there was nothing odd about it, “Hold your breath, there are corpses lying in the cellars here.” People here are prepared to put up with a lot to avoid that happening again – they are ready to pay for peace with silence. Are you still an optimist? Actually, I’m pretty pessimistic about the future. But you have to believe in the success of whatever project you’re engaged in, otherwise how else can you work? Oyub Titiuev, the head of Memorial’s Chechnya office, is currently on trial on drug possession charges. Do you believe in the possibility of success in this case? Titiyev’s lawyers are working brilliantly, but the verdict isn’t in their hands. But if Vladimir Vladimirovich [Putin] was to talk to Ramzan Akhmatovich [Kadyrov], and he were to tell the trial judge that it was time to wind the case up, we could perhaps expect a relatively positive result. If he is acquitted, however, it won’t be thanks to the brilliant work done by his defence team, but only if Vladimir Vladimirovich has a word with Ramzan Akhmatovich. Previous trials on drugs charges in Chechnya have ended with real prison sentences. Yes, I feel really guilty — we basically missed two previous cases because we didn’t make enough noise. These were the trials of human rights campaigner Ruslan Kutayev, who was also tortured, and journalist Jalaudi Geriyev, who was supposedly arrested in a cemetary in possession of marijuana, which he was going to smoke, even though he had a flight booked that day. No one seems to believe in our courts anymore; it’s just that in Chechnya the lies are even more blatant and preposterous. 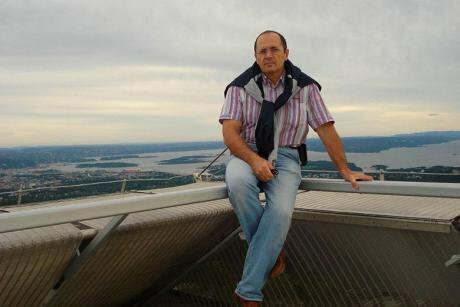 200 grammes of marijuana found on Titiyev, a former PE teacher? Everyone knows Oyub is innocent. All he’s done is defend people and permit himself to criticise the authorities. He wouldn’t have anything to do with drugs. The arrest of Oyub Titiyev has provoked international outcry. Source: Memorial Human Rights Center. What’s interesting here is the dynamic: the higher the quantity of a drug required for a criminal charge to be brought, the larger quantities the police have begun to find. So it’s clear that it’s all a complete fabrication. You also don’t believe in the Russian judicial system. When the judicial system is in a state of total collapse, the guarantor of the Constitution is its chief violator and parliament is completely subjugated to the executive power, an explosion is inevitable. Who will be in charge of lighting the fuse? Those who created this system. We don’t need any external pressure, any “State Departments” to hold a revolution. I feel – and this is to my great disappointment – that our rulers lack all sense of self-preservation. Because any destabilisation becomes a trigger for groups who are inclined to use violence – nationalists and the police. Neither of these factions will hesitate to employ force and extreme measures. “God forbid that we should see a Russian revolt, senseless and merciless” – Pushkin’s words are as relevant today as in his time. “Everything is falling apart,” that’s one of the first things you said to me when we were arranging this interview. Is this your pessimistic forecast? The governmental system is in a state of collapse. And this is called “Russia rising from its knees”. I don’t know when it ever was on its knees – this is some complex that Putin has. Our government thinks that it has the right to decide what’s good and what’s bad, no matter what the law says. Take the education system, for example: migrant children are being excluded from schools, even though Article 43 of the Constitution guarantees, among other things, a universal right to education. And what can we expect from these children, for whom Russia is a hostile environment that rejects them? President Putin recently promised to simplify the process for receiving a Russian passport and offer asylum to people experiencing persecution. And on the other hand, he proposed passing a law that would remove someone’s citizenship if they were convicted of terrorism, extremism or other criminal charges. Or, to be exact, it wasn’t even a question of loss of citizenship, but of the annulment of the original decision to offer citizenship. The official logic runs like this: if someone has sworn to uphold the Constitution, and then committed a crime, then that is a question of “knowingly fraudulent information” which can declare their citizenship null and void. This is like calling a calling a marriage fictitious on the grounds that the couple promised to love one another and then one of them cheated on the other. Is this a false theorem? It is ignorance of Einstein’s theory of relativity: first, there has to be a cause, and then an effect. But our lawmakers work in the opposite direction. Do you feel you have support from other people (and not just commentaries on social media)? Of course. We have more volunteers than we know what to do with. Our work also attracts the attention of the foreign press and we have endless invitations to conferences. But unfortunately, we’re better known abroad than we are in Russia.